Govt Shutdown Update: DC Courts courtrooms are fully operational, jurors should report and cases may be filed. The Marriage Bureau, Child Care Center, and other support offices, however, will be closed during the shutdown. Engaged couples will not be able to apply for marriage licenses, drop off or pick up marriage licenses already applied for, or obtain certified copies of marriage licenses during the shutdown. All courthouse weddings scheduled have been cancelled, and no DC Marriage Bureau staff are present to reschedule those marriage ceremonies. 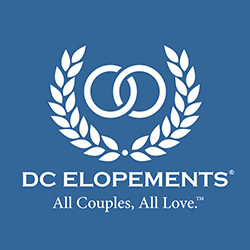 DC Elopements is currently assisting couples affected by the shutdown by redirecting services to Maryland and Virginia. Any couples wishing to get married in Washington, DC during the shutdown are advised to contact DC Elopements at 800-721-8697 or https://dcelopements.com/contact/ for advice on making alternative arrangements.